Both were offered as either a drop head coupe or a four door saloon, and their engines were based on pre-WW2 4-cylinder, side valve units, but which were now fitted with uprated cylinder heads using an overhead valve arrangement. 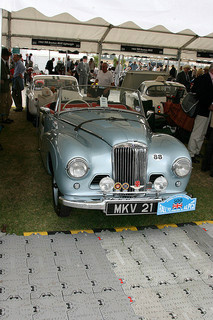 Designated the Mark 1, they had a four speed gearbox, used a column gear change, and remained in production until 1950. 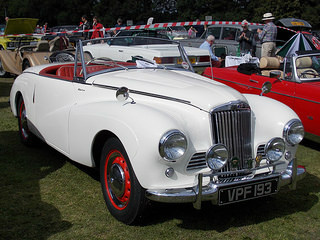 Following some styling changes both inside and out, the improved Mark 2A drop head coupe was launched in 1952, and was used as the basis of a stylish convertible, the Sunbeam Alpine sports, which was introduced in 1953. 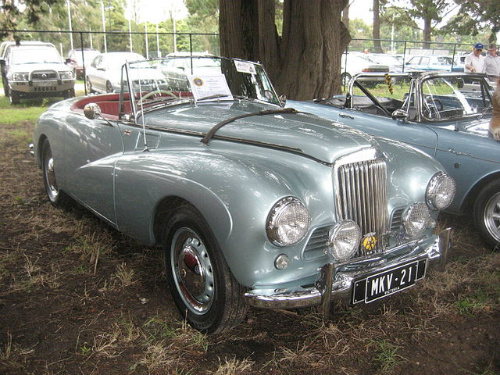 The Sunbeam Alpine was produced between 1953 and 1955. 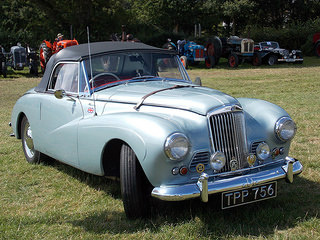 Although based on the Sunbeam-Talbot 90, it was simply called either the Sunbeam Alpine or Talbot Alpine, but not the Sunbeam-Talbot Alpine. It was a two seater convertible originally modified by George Hartwell, a Sunbeam-Talbot dealer, as a limited edition rally car. It used the same 2267 cc, 4-cylinder, overhead valve engine as the Sunbeam-Talbot 90, combined with a single Stromberg carburettor. However, the compression ratio was increased from 6.45 to 7.5:1, which produced 80 bhp, and a top speed of 96 mph. One of the features of the Alpine was its emphasis on the comfort of its occupants, which included deep cushioned seats, a very efficient heater, and plenty of luggage space. Compared with other British sports cars, it was more powerful than the MG TD, but was no match for the Jaguar XK120, even though the two cars weighed the same. This aside, the Alpine fared well in international rallies. A special edition Alpine, fitted with a highly tuned engine developing 106 bhp, reached 120 mph in the hands of the famous rally driver Sheila van Damm. The name Alpine was attributed to the previous Sunbeam-Talbot's rally success in the six day Coupe des Alpes, driven by such notaries as Stirling Moss and Sheila van Damm. In the 1953 Alpine Rally, the prize of the Coupe des Alpes went to a team of four Sunbeam Alpines, one of which, driven by Stirling Moss, finished in sixth position. Another entrant, Sheila van Damm, won the Coupe des Dames. In the Alpine rally a year later, Stirling Moss again won a Coupe des Alpes driving a Sunbeam Alpine. In fact, he was one of only two rally drivers to win a Gold Alpine Cup in the Alpine Rally. The Sunbeam Alpine was discontinued in 1955, but the name was revived in 1959 with the advent of the newer, smaller, Sunbeam Alpine Series 1. The original Alpine sports car was hand built by the coachbuilders Thrupp and Maberly in both the Mark 1 and 3 versions (for an unknown reason, a Mark 2 was never produced). Out of a total production of 1,582 of the Mark 1-3 Alpine, 961 were exported to the US and Canada as left hand drive models, 445 stayed in the UK, and the remaining 175 were exported elsewhere. A 1953 Sunbeam Alpine Mark 1 in superb condition was placed at auction with a guide price of between £12,000/$19,000 and £17,000/$27,000. On the other hand, an example of the same model that required a complete restoration was offered at £2,000/$3,000.